Polybloggimous: Spotted In The Wild Today. I'm not so sure it's as uncommon as I may think it is, but the fact is, I can't recall the last time I saw one of these in use. Those of you not in the film biz (which is most of you who visit here), are free to tell me in the comments what you think it is. You get points for the generic name. More points for the product brand name. Oh, BTW, there was an entire film shoot going on with lots of trucks and everything, but I just shot a closeup of this poor guy sitting in the street all by itself. I suppose it ought to be happy it got a trip out of the rental house. No points. Really good try, but no points. BTW...I almost put in a note saying you (as in, specifically you) would be cheating if you used your GoogleGoggles again. I figured out the New York subway map using a google goggles type thing but I don't think it would be of much help here. I'm answering cryptically because apparently not many of us work in film. It's a toy that children may own. I don't know about the specific type though (never seen one, just other species) is it a word which is an animal (hence the wild) but also for something else completely different? Fascinating. I have absolutely no recollection of that event. Again, I freely admit, it does sound like something I'd do, but I honestly don't remember doing it. Weird. as to the "in the wild" thing...that wasn't meant as a clue, but we're more in the insect family here. Yeah but just spitting it out is mean on other people trying to guess. I'd say more along the lines of a barbie doll. Guess we're talking about the same insect, is it a sport too? Yup...it's a sport. But if the center post was cylindrical, it'd be a totally different insect. You've done very well. You've snatched the pebble from my hand. Well - it looks like a tripod of sorts to put a camera on - that will move in all directions during filming however I thought cameras were way heavier than what that thing looks like it can hold. Welcome to the blog Leslie. I suppose, since I'm really impatient, I'll go ahead and spill the beans. As Jenny hinted, the item is a Camera Dolly -- meant for getting a variety of moving shots. The particular one in the shot is an Elemack Cricket (the game). An earlier model, with the cylindrical center post was the Spyder. Like I said, Elemacks may be in common use, but I rarely see them. Fisher and Chapman make the dollies that are considered the industry standard and those are what get used the most. The thing is, both of those companies will franchise out their dollies to rental houses and they rent direct to some customers, but you can't buy one. Elemack is one of the companies that sell their dollies to end users and rental houses. And contrary to how it may look, that dolly will take a pretty heavy load of camera -- there's also a jib arm (sort of a mini crane) that's made to mount on it. P.S. I won't feel the least bit hurt if someone tells me these guys are all over the place being used a lot more than I'm aware of. Maybe there's some applications in which they're preferable to other dollies? Wrong, wrong, wrong. It's an evil robot. Sheesh. They'd get a lot more use if they could do that! Sadly, the original prototype for the Segway was strikingly unimpressive. 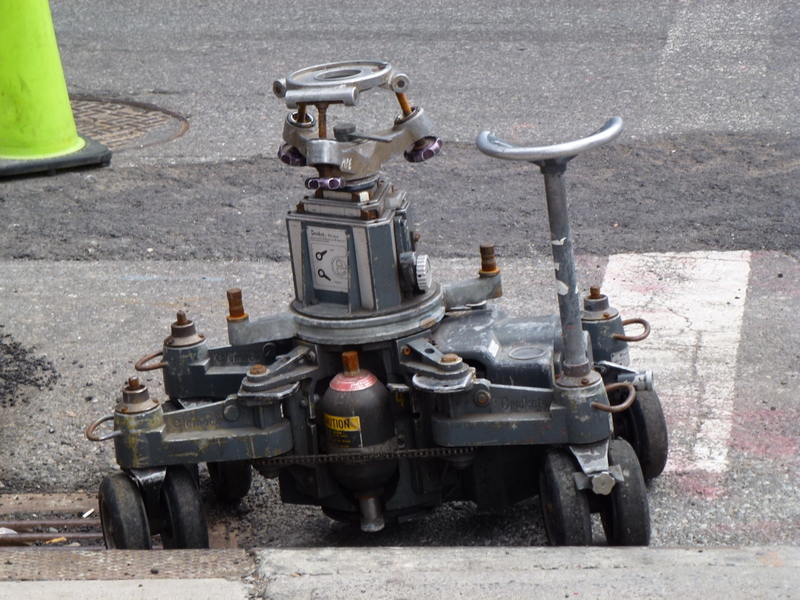 For one thing, the number of wheels made the gyroscopic stabilization systems completely redundant and ineffectual. For another, the lack of any kind of waist-high handle or steering control made the prototype Segway personal transport nearly impossible to maneuver and drivers tended to fall off the device more frequently, especially during sudden stops, unless the passenger crouched over the transporter practically on all fours. Finally, inventor Dean Kamen felt that while the Segway X-1 "makes the passenger look stupid, the device itself is insufficiently-stupid-looking; I want the transportation system of the 21st Century to be as completely humiliating as possible, and this just isn't quite what I had in mind." Having cost 37.5 million dollars in development, the X-1 was nonetheless quietly scrapped and Kamen and his investors began pouring another 70 million into the two-wheeled stabilized personal transporter that would ultimately be revealed to the public years later. All right. This is either an industrial size roto-rooter, or of of those things that draws lines on the roads or sidewalks. Haven't seen one in years, but sure could use one some days.